Smoothies are a brilliant way to get a lot of nutrients into you in one go. Take a green smoothie for example, you can literally pack an entire salad or plate of greens into one glass, yet it’s easy to finish and you don’t feel overly full afterwards. The reason for this is the ingredients have already been partially broken down by the blender blades which means they are more readily digested and absorbed by your body. This in turn means your body doesn’t have to put as much energy into digestion and can turn its attention to other important processes such as detoxification and healing. The other amazing part about smoothies is the ingredients are entirely raw which means all the nutrients are in their original unprocessed state. This means all the the vitamins and minerals remain intact, as well as the foods inherent living enzymes (which are often killed by heat), and these assist the absorption of the nutrients which takes the pressure off your digestive system. So essentially, by eating raw food you can maximise your nutrient intake in a very easy way. One thing to keep in mind when choosing food you’ll be eating raw, is to consider buying organic, spray free produce, otherwise it kind of negates the whole point. 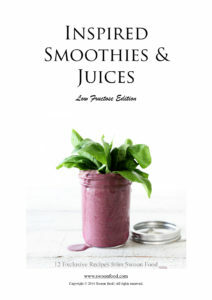 Because I’m a big smoothie fan I decided to create a second third edition of my Smoothie e-book, and this one’s even bigger and better! 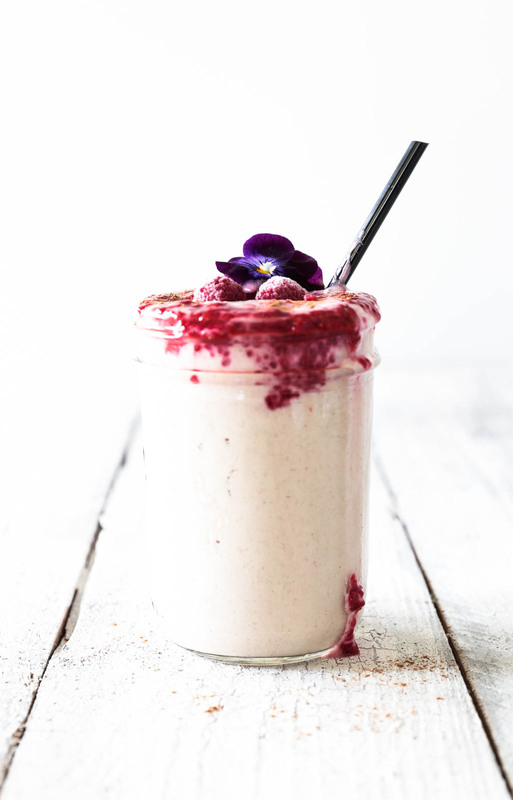 Called Inspired Smoothies – Low Fructose Edition, it’s a collection of 10 12 of my most favourite, low sugar smoothie recipe which you can download for FREE when you join Swoon Food’s email updates here. 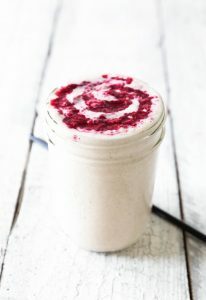 The cinnamon jam donut smoothie recipe below is now from the second edition, but it’s still one of my favourites. It’s a great example that not all smoothies necessarily have to be green to be good for you! Even though it has a decadent name, it’s actually a very healthy smoothie and is a great energy and protein booster! 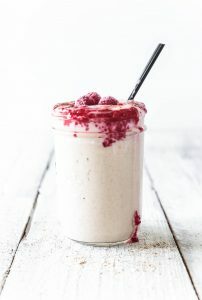 The best way to describe this smoothie is a thick, creamy vanilla milkshake with hints of cinnamon, banana and caramel, and when topped with raspberry chia jam it really is reminiscent of a jam donut. It has a base of cashews nuts which are a great source of pant protein and are high in magnesium which is vital for bone health and helping your body and muscles relax. Bananas are one of the best sources of manganese which jump starts the metabolism and encourages wound healing. They’re also a good source of vitamin B6 (vital for so many processes! ), vitamin C (boosts immunity, reduces inflammation, and slows the ageing of skin) and copper (essential in the development of blood cells). Dates are also high in vitamin B6, vitamin A, potassium, iron, phosphorus, calcium and fibre. Raspberries are a naturally low fructose fruit and are also a great source of antioxidants and fibre. Last but not least, chia seeds are a great source of omega-3 alpha-linolenic acid which is beneficial to the brain and heart, and contain all 9 essential amino acids making these little seeds a complete plant protein. 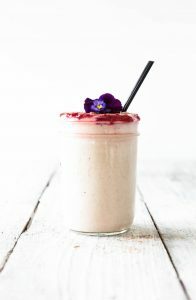 You need to plan ahead a little for this recipe as the cashew nuts require soaking for 2-4 hours beforehand which ensures you create a super smooth and creamy smoothie. However, if you don’t have time or just want the smoothie asap you could do away with the soaking step provided you have a high speed blender that will blend the cashews finely. Also, make sure you have frozen bananas on hand as these really add to the thick and creamy chilled texture. A great tip is to keep a stash of peeled, chopped bananas in your freezer so that you’re always smoothie or nice cream ready! Hope you enjoy this recipe, if you make it and post any pictures to instagram I would love to see them – tag me @swoon.food and #swoonfood so I can come and admire them! Do you make smoothies often? Any questions about this recipe? Share in the comments below – I’d love to hear from you! Make sure you have frozen bananas, plan ahead and put them in the freezer a couple of hours beforehand or better still keep a stash in the freezer ready for smoothie and nice cream making. To soak the cashew nuts, place them in a bowl and cover with filtered water and leave to stand for for 2-4 hours. Drain and rinse well. Prepare the chia jam by washing the raspberries well. If using fresh raspberries, place them in a bowl and simply crush with a fork until they become juicy. Combine with the chia seeds and stir well. If the raspberries are frozen heat them a little either in the microwave or in a small pan over low heat until they become soft and juicy. Transfer to a bowl, combine with the chia seeds and stir well. Set the raspberry chia jam aside to thicken, which should take about 5-10 minutes. To make the smoothie, place the cashew nuts into a blender jug with the frozen bananas, cinnamon, vanilla, dates, water and ice. Blend on high until all the ingredients are well combined then pour into your serving glasses. 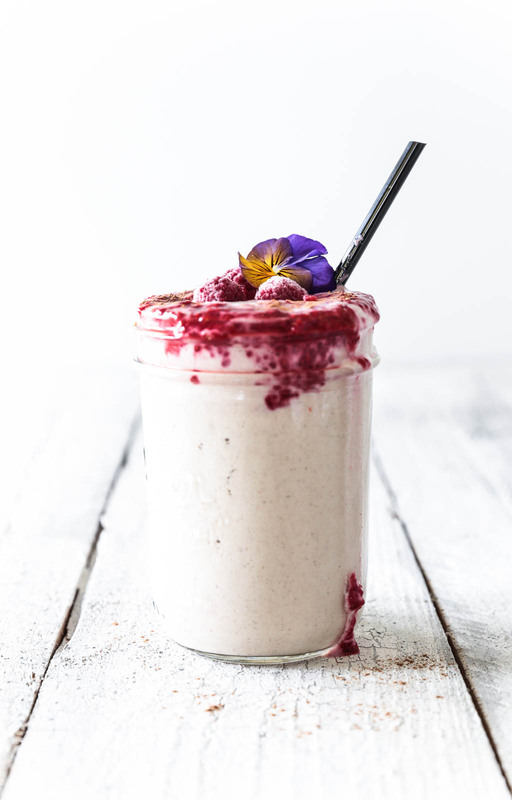 Spoon a layer of raspberry chia jam onto the top of each smoothie and swirl with a spoon. Sprinkle with a little cinnamon and place a couple of extra raspberries (fresh or frozen) on top. Serve and enjoy! Note: If you want to make these smoothies ahead of time, keep the chia jam separate and store in sealed containers in the fridge for up to 3 days. When ready to serve top with the chai jam, cinnamon and raspberries. I’m pretty sure id take this over an actual donut any day! this looks amazing!!! Doughnut smoothie!? Um, yes! I’ll take 3! lol!